I left the Salvation Army around 6yrs ago to attend a Baptist church, but during my time there I didn’t make any friends and found it hard to be accepted and to become involved in the church and use the skills God has given me. I’ve always had a heart for the Army, I missed the people and singing with the Songsters. For the last 4 years, after being made redundant, I’ve worked away which meant that there were periods of time when I was unable to meet with other Christians. I’d listen to songs and teaching on Premier Christian radio and Joyce Meyers daily Bible message, then one day I Googled ‘Peterborough Songsters’ and couldn’t believe how many songs I could listen to on YouTube! Amazing! I then started reading the Corps Newsletter on-line too. Over a period of time God directed my mind towards coming along to the ‘Christmas Extravaganza’ – I was amazed at how many people spoke with me and not only said “Hello” but were conversational too. Two weeks later I found myself at the Carol service where again, people were just as friendly. Bible teaching is important to me and I felt prompted by God to come along on Sundays when I wasn’t working and check the Officers out and listen to their teaching. Ken, who I knew from my previous time at the Army regularly commented ‘so you’ve come back! !’ to which I replied "no, just visiting"!! In March Julian invited me to join Songsters and I really started to feel like I’d returned home. 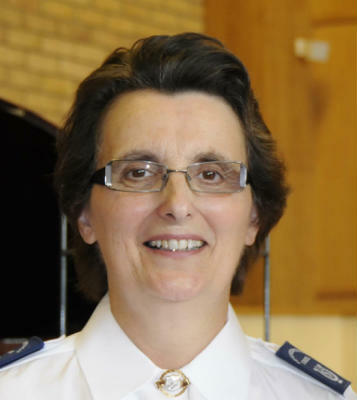 I know that this is the place where God has brought me, so I spoke with Kathy our Officer regarding going back into uniform, which is important for me as I feel it’s part of my statement of faith. ......... I know the words are true and fully believe He holds me and that His way is best. You’ll receive a warm welcome if you visit us at the Salvation Army.